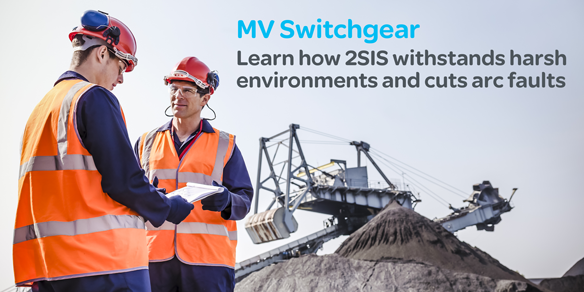 The demands that the two-way flow of energy in smart grid places on MV switchgear raises a critical question: can it cope with the rigours of operation in the toughest environments? One kind can. It is shielded solid insulation switchgear, or 2SIS. I like to think of switchgear insulation as belonging to two categories depending on how it can withstand “normal, severe environmental conditions” or “harsh environmental conditions”. And 2SIS definitely can withstand the most aggressive conditions. Let’s put it into perspective and compare it with existing switchgear insulation – air, gas, and solid – against the yardsticks of withstand and footprint. Air-insulated switchgear (AIS) uses atmospheric air as phase-to-ground insulation. Its advantages are its modularity and flexibility and high standard of electrical performance, both of which are real requirements in some applications. The downside? Big footprints and sensitivity to harsh environmental conditions, which makes it prone to electrical field variations that can lead to internal arcing.. Sound installations are necessary, too, to draw full benefit from the advantages of AIS. In gas-insulated switchgear (GIS) the gas is compressed, so reducing the clearance between components and casing and the phase-to-phase/ground spacing. The result is much more compact switchgear that also delivers the high voltages and currents that many applications require. Because all the live parts are sealed into metal casings and insulated by gas, GIS is safe, reliable, and insensitive to harsh conditions. And pretty much maintenance-free. Although GIS is very much of the aggressive condition class, it has disadvantages: low flexibility and upgradability and long down times in the event of an outage. What then of solid insulation? SIS is, like AIS, sensitive to harsh environments. Shielded solid insulation switchgear (2SIS) is very different. Like GIS, it withstands even the most aggressive operating conditions, and is highly compact. Unlike GIS, however, it is modular and flexible and easy to maintain. Both GIS and 2SIS use earthed shields to block electrical field lines. And the climate cannot affect the electrical field which, as it is contained in the insulating medium, is kept constant. A constant electrical field ensures a long service life and cuts the risk of internal arcing to almost nil. The actual insulation is made from silicon, resin, or elastomer. It wraps the switchgear’s live parts as closely as cling film and is in turn coated by a conductive layer. As I said above, 2SIS is highly flexible. Thanks to its patented space-saving flat interface, its flexibility extends to its open-endedness. A wide range of MV power systems can be connected to the flat interface of 2SIS’s interconnector. The insulating surfaces are compressed hermetically together, so bringing the conductors into contact and ensuring earth continuity. 2SIS is really the perfect solution when the available electrical performances are sufficient especially in industrial applications. Finally, a last word on arcing. The very design of 2SIS precludes the possibility of two- or three-phase faults. And any internal arcing is only very low-magnitude single-phase faults. Want to know more about 2SIS? Please click here. Very clear and synthetic view of switchgear technologies. More, I’d add that technology evolution is bringing new values for customers and is solving historical problems. Here, we see the 2SIS combining the best of all existing technologies, for one goal : Make our customers’ life easy and ensure them the peace of mind they are dreaming about….